First and foremost I couldn't afford a Celine clutch, I know terribly sad, so I had to make do with the next best option... the Comme Des Garcons clutch. And by next best option, I mean BEST option. I absolutely love this clutch and the color is so great. It really adds that pop. Those photos you see on the internet of bright clutches, it's true they really look that bright in person! Aren't you just overjoyed to learn that fact? I absolutely love this clutch and I am so glad I spent 1/4 of my paycheck to pay for it.... haha not exactly, but still it wasn't nothing! On our travels throughout the city the BF and I came across this wall in Soho. Of course I said, "BF pitcha time"! He felt highly embarrassed by said situation (it was a busy street) so we only took a couple photographs... but they turned out great! I absolutely love them. The colors, oh the colors! Yes, that wall is pretty amazing. Good job BF lol. I love Equipment blouses too. AND...I also have a small obsession with clutches at the moment. Came across some Clare Vivier clutches today and O...M...G! Must have! love the clutch because i have been dying over the cline ones. i was thinking of just getting the AA ones. but i love urs and i love the matching nail polish. where is ur bracelet from? beautiful outfit, I totally love it! I TOTALLY share your love for Equipment blouses -- I just wish I could afford them right now! I currently have my eye on a leopard print one and am hoping, probably fruitlessly, that it will eventually go on sale. P.S. I agree with Shelby and Catherine -- love the new banner! You look really good. Giving some 70's vibes! And love the color of that clutch. I have a similar looking clutch, with a strap so you can carry it around your wrist. But the color isn't nearly as bright as yours! Maybe I'll spraypaint mine haha! Very good the formal look, your face is amazing girl! 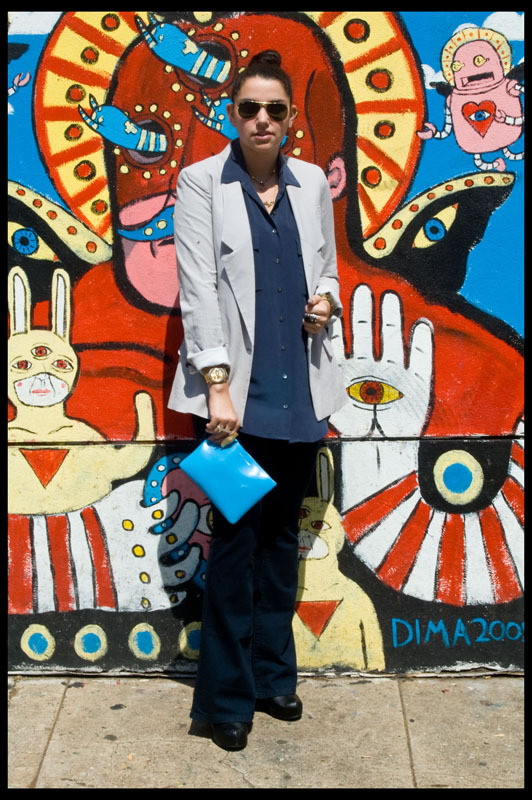 Oh that clutch is a great Celine knock off, love the way it adds some fun to the sleek outfit, graffiti wall was the perfect set! 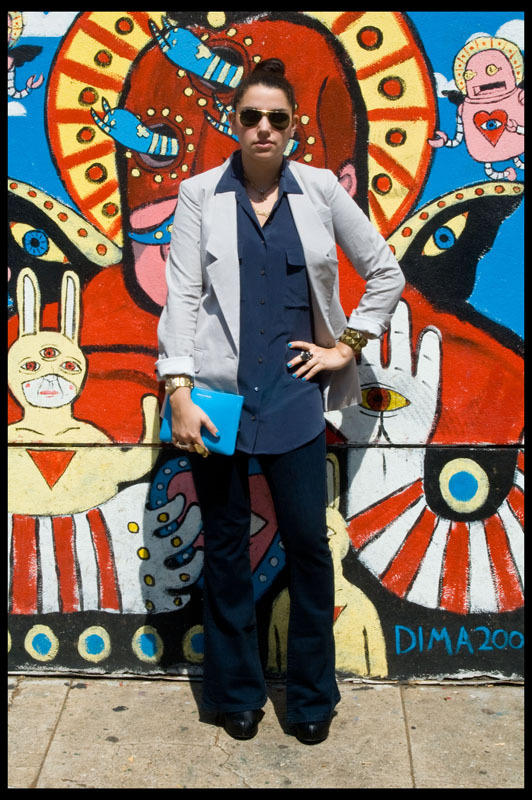 that mural is sooo coool i hate u i wanna live in nyc :) i love the peek of the collar over the blazer. SEE YOU IN A DAY! Ooo, that clutch is awesome. Love the picture in front of the wall! great pics - it was worth a little boyfriend embarrassment haha! LOVE that clutch! This is a fantastic outfit!! The clutch is the best part I think:) I love the brightness of it. nice, I like this trousers so much! i love how you label the items! cute outfit as well.. 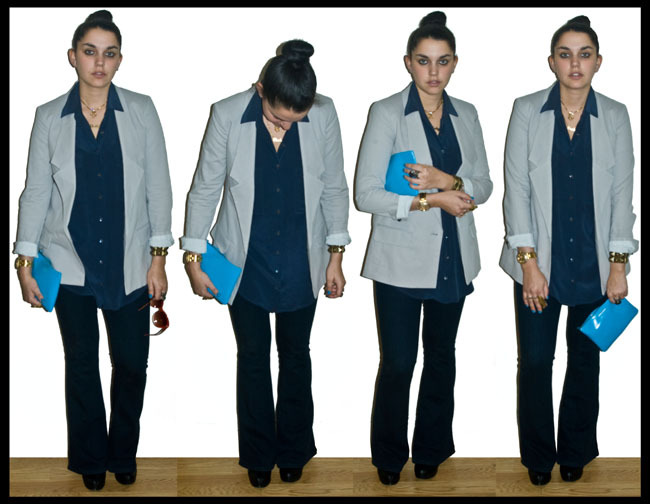 I love the baby blue clutch and the structe of this oufit! The clutch is PERFECT!! That color, wow. Great pics too! Uhhhhh I LOVE this outfit, Gaby. All the blues are perfect - the color of that clutch is phenomenal. I also love this look with the flares. So 2011! The blue clutch is perfect with this outfit! Great pairing! This came out on my birthday so I HAVE to comment, besides the fact that this outfit is so chic and I love how you coordinated your clutch with your nails in one of my favorite shades:) Love!